Halloween if finally here and I hope by now everyone has their costumes... if you don't then I won't feel that bad because I still don't have mine... Can you believe how much stress you can feel about a silly costume? Maybe I should reprise last year's Breakfast at Tiffany's dress. Another great thing about this weekend is that I'll be watching the Rally to Restore Sanity and/or Fear with John Stewart and Steve Colbert... As I said before I have no political affiliation but I do believe they are pretty funny and I like how they make fun of all the silly politicians, especially right before the Midterm Elections here in the US. Wishing you a wickedly frightening great weekend! Wonderful I am going to be a Martini Glass....will post after the party! I love the Tiffany's dress reprisal idea - can't go wrong (Holly Golightly would probably approve :). 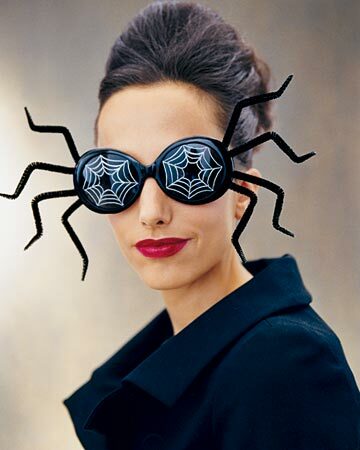 These spider glasses are hilarious, I need a pair for Halloween! Hope you have a relaxing and fun one, and thank you again for all the great links you always have! Oh I am a party pooper when it comes to costumes! I am just doing the cat thing, but I am doing the whole made up face with it. Whiskers and all. Have an awesome Halloween! Love that photo! Love the Lingerie NY photos! You can't ever go wrong with Holly Golightly, as long as you have a fabulous pair of sunglasses! Happy Halloween weekend! Love the fashionable scary image =) Thanks for the links and hope you get your costume! So many fun links! Hope you have a sweet Halloween weekend, Elie! So much fun, where can I find one of those? lol! Thanks for joining my virtual Halloween party!